The following is the Press Release that I drafted in relation to this exhibition, which was held in Penzance in the autumn of 2010. "Sea Change – Art in St Ives 1914 -1930, which runs at Penlee House Gallery & Museum, Penzance from 11th September to 20th November, is the first exhibition highlighting the extraordinary diversity of work produced in St Ives during these years – a period of transition during which the colony had to adapt to significant changes artistically, politically, socially, economically and demographically. 1914 started out so promisingly. That summer, under clear blue skies, no fewer than fifty American artists had been working in the town. This demonstrates the international reputation that the colony held at that juncture as a centre for both the practice and teaching of landscape and marine painting. American artists from this group featured in the exhibition include the famous marine painter, Paul Dougherty, Guy Carleton Wiggins, a member of one of America’s most famous painting dynasties and Henry Bayley Snell, who had brought with him a group of students from the Philadelphia School of Design for Women. The outbreak of War, however, resulted in a complete change of personnel, as most of the Americans scuttled home, and young artists in the colony, such as Borlase Smart enlisted. The exhibition contains four of the evocative charcoal and wash drawings of scenes from the Western Front that Smart did during his period of service with the Machine Gun Corps, some of the very first works acquired by the Imperial War Museum after its foundation in 1917. Other works drawn from the Museum’s collection include Charles Bryant’s depiction of dazzle painted ships, a ploy devised by St Ives School of Painting alumnus, Norman Wilkinson, and Ruth Simpson’s life-size portrait A Company Commander. 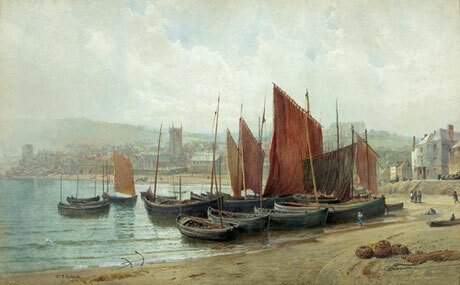 The perception of St Ives as a safe haven also resulted in a number of artists, with widely differing techniques, settling in the colony throughout the hostilities, so that, although the output from the colony was reduced, it was considerably broadened in scope. These included the New Zealander, Frances Hodgkins, who described her time in St Ives as her "experimental years". Encouraged by Moffat Lindner to take up oil painting seriously, one of her first efforts was Loveday and Anne, a depiction of a fisherman’s two daughters, which Lindner bought from her to encourage her further. The colony also played host to two esteemed Belgian refugee artists, the monumental symbolist painter, Emile Fabry, and the watercolourist, Louis Reckelbus. Sadly, Fabry’s masterpiece from his St Ives years, a huge mural designed for University College, Cardiff is too big to fit in at Penlee House, but his symbolist work is represented by the drawing in blue pastel entitled War, showing an angel holding a dead soldier. Reckelbus introduced the colour of the Fauves into the colony and several examples of his immensely colourful and decorative watercolours are included in the show. Other artists producing innovative work during the War years were Louis Sargent, who depicted the Cornish coastline in ever more vibrant hues, and Claude Barry, who began his experiments with pointillism. His Peace Night in Trafalgar Square, showing crowds madly jazzing under Nelson’s monument, with the sky lit up by searchlights and a firework display, will be one of the highlights of the exhibition. 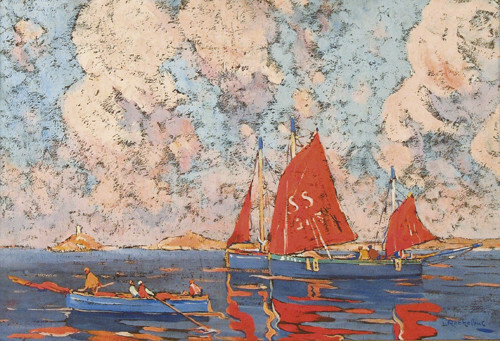 During the 1920s, a number of artists, such as Charles Simpson, Borlase Smart and John Park, who had drawn inspiration from the landscape and marine painters of the pre-War years, settled in the colony and remained wedded to open air painting. Simpson, during his period in the colony (1916-1924), totally dominated the local scene, producing an astonishing number of important paintings in a wide variety of styles. He had a particular fascination with painting objects contra jour and two fine examples in the show are The Flight of Wild Duck, showing mallard rising in alarm off the Lelant marshes against the setting sun, and The Herring Season from My Studio Window, depicting the busy scene on the Wharf at daybreak as the catch is landed. The 1920s also witnessed the heyday of the print market, as a collecting craze led to a speculative bubble. In St Ives, the key figure was Alfred Hartley, whose clients included the King and Queen of Italy and who won several international medals. He also drew down to St Ives the Canadian, Donald MacLaughlan, and Sidney Long, who became Australia’s leading etcher and gave Hartley credit for initiating his interest in etchings. The 1920s also saw the development of the cult of the naïve vision, as a number of artists were seeking to dethrone the standard, academic easel painting, with all its falsities, and believed that one must go back to the beginning and look at things through the eyes of a child or of a primitive. Christopher Wood, who visited Cornwall three times in the twenties, and Ben Nicholson were two such artists and, accordingly, they were immensely excited by their discovery of Alfred Wallis in St Ives in 1928, for he appeared to demonstrate innate untutored creativity. As a result of Nicholson’s promotion of Wallis, he subsequently became the touchstone for the whole St Ives modernist movement. The 1920s also saw the dawn of St Ives as a centre for the decorative arts. Handiwork played a much greater part in exhibitions than it had ever done before and a Gallery at Lanham’s was devoted solely to craft shows. The Leach Pottery has, of course, become the most famous of the handiwork ventures set up that decade and the exhibition includes a section devoted to the pots of Leach, Hamada and Michael Cardew, a number of the exhibits highlighting the more pictorial aspects of Leach’s pot decorations. There is also a section on Cryséde, whose hand block-printed textiles were based on designs of Alec Walker drawn from his modernist paintings of the local landscape. These make a fascinating contrast to the landscapes of both the traditionalists and the naïve painters. The exhibition demonstrates that, even against an extremely difficult political and economic backdrop, St Ives still retained the ability to attract distinguished artists and inspire them to produce seminal works."